Boun Lod and her mother Noi arrived back in Cincinnati on May 26, after a long but uneventful trip via Bangkok, Tokyo, and Detroit. 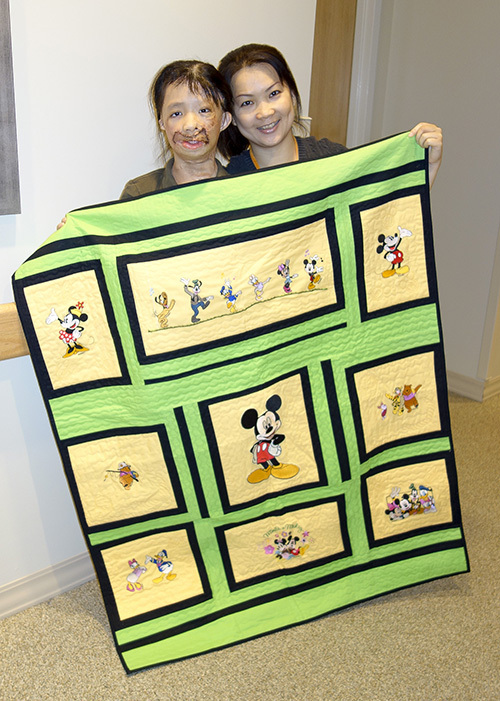 After a few days recovering from jet lag, Boun Lod found herself back in the familiar surroundings of the Shriners Hospital for Children where she had a series of medical tests and evaluations. The doctors were pleased by how she had healed, and by the range of motion in her arms. The previous surgeries, along with the ongoing therapy (both in the hospital and at home with Noi), seem to have been very successful. 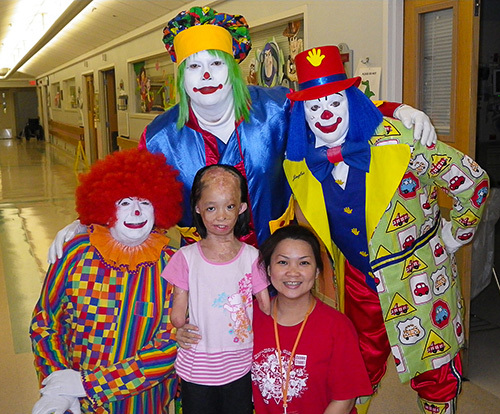 Now that some of the major surgery has been done to allow Boun Lod to grow and develop properly, the surgeons are turning more to her cosmetic needs. Boun Lod’s first surgery this time around was on June 13. The surgeons took a piece of skin from the back of her arm, attached it to her lower lip, and then lifted the skin to form a new lip. The early-morning surgery went well and, by the end of the afternoon, Boun Lod was anxious to get her IV out so she could go to the playroom. Boun Lod was discharged from hospital the next day. Noi and Boun Lod. Feeling Better Already. 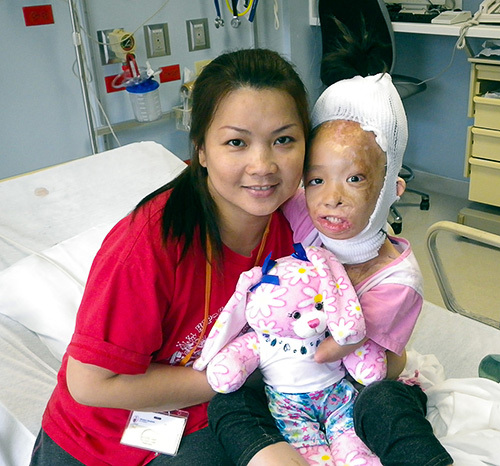 A week later, Boun Lod was back to the clinic to have her stitches removed, and to be fitted for a hard plastic facemask. The facemask will help reduce scarring, and will help her new lip heal properly. While at home in Laos for the past 18 months, Noi continued to take English classes at Vientiane College, and her English is getting better and better. Noi now understands and speaks well enough to get by in most day-to-day situations. Boun Lod’s English is also improving, and she understands much of what is said. 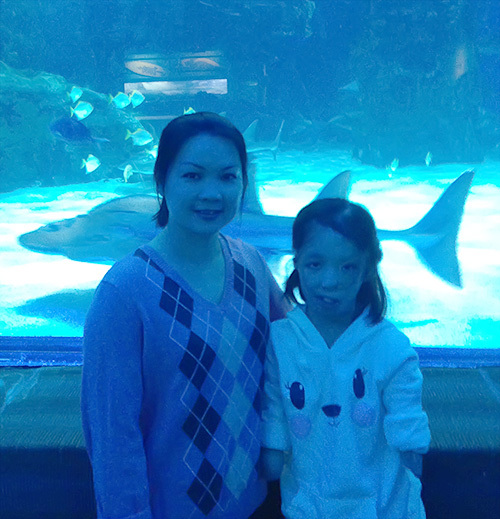 On July 1, Noi and Boun Lod flew to Philadelphia to stay with family until Boun Lod’s next appointment in Cincinnati in early August. At that time, the doctors will evaluate Boun Lod’s progress, and will decide on the next surgery. 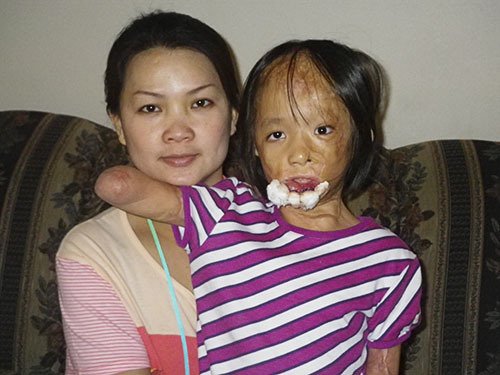 Boun Lod will also make regular visits to the Shriners Hospital in Philadelphia where she will continue the training on how to use her prosthetic arms. 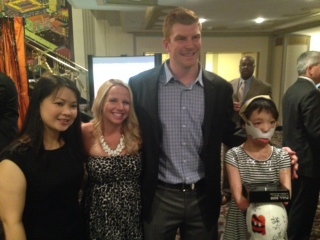 Come September, we hope to get Boun Lod back to school in Philadelphia. Hopefully, her good friends Cindy and Gemma will still be there. I bet she’s looking forward to seeing them again. 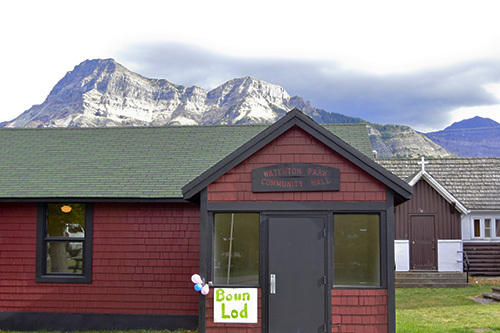 Boun Lod continues to do well. In September, she started going to kindergarten three days a week. Boun Lod loves kindergarten, and her mother says she doesn’t want to go home at the end of the day. Naturally, one of the best things about kindergarten is playing with the other kids. Boun Lod has two best friends, Gemma and Cindy, who help her with things like putting on her shoes and socks (tough to do without arms and hands!). By September, Boun Lod’s father had been away from his job for almost a year, and he had to return home to Lao. While Boun Lod and Noi miss him, they’ve now had enough experience with the system to get by on their own. This Halloween was Boun Lod’s first real experience with all the ghosts and goblins and, by all accounts, she enjoyed every minute of it. Unlike some of her friends who dressed as fairies or princesses, Boun Lod went as the Tasmanian Devil, which does seem fitting somehow. 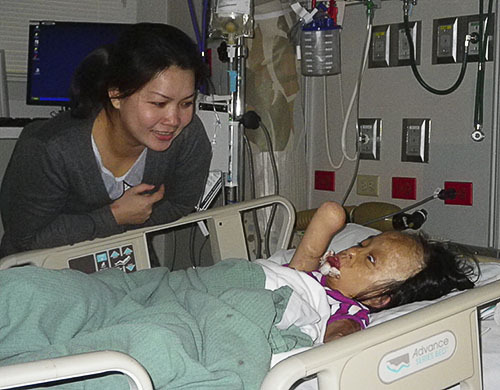 Boun Lod has also been going to the Shriners Children’s Hospital in Philadelphia two or three times a week to learn how to use her prosthetic arms. Apparently she’s getting quite good with them, and can pick up small objects, use a pencil and paper, and so on. 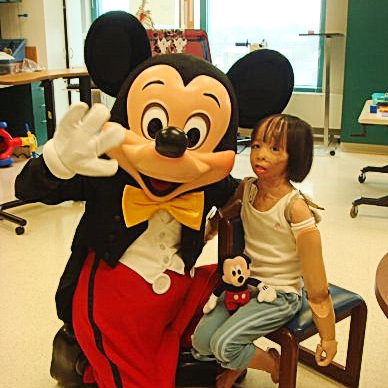 Mickey Mouse visited the hospital one day, and the kid’s were given tickets to “Disney on Ice”. While I don’t think Boun Lod has developed a liking for cold, ice, or snow, she was entranced by the show. Boun Lod with Mickey Mouse. All of this activity has been good for Boun Lod’s English. She understands a lot of what’s said, and isn’t shy about saying a few words. Boun Lod’s mother’s English is also really improving. Noi understands and speaks well enough to get by in most day-to-day situations. 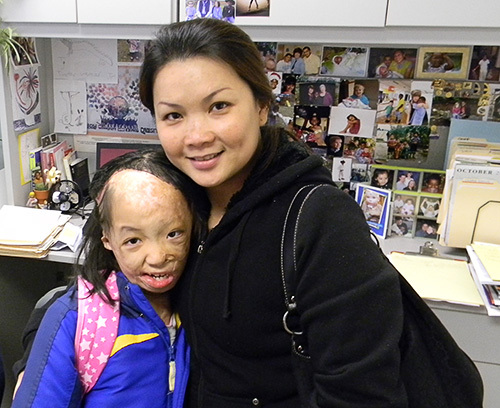 On November 20, Boun Lod was back in Cincinnati for surgery on her neck, mouth, and eye. The skin graft for her neck was taken from her leg. For the next three months, Boun Lod will have to wear a stiff collar to keep her neck stretched so it will heal properly. By March, Boun Lod should be all healed up from this latest surgery, and the doctors feel it would be a good time for her to return home for a break. Probably in the summer of 2011, Boun Lod will return to Cincinnati for another 12 to 18 months of further surgery and treatment. Boun Lod needs a good education if she is to have a fighting chance for a decent future, and she’ll be the right age to start school when she gets back to Lao. 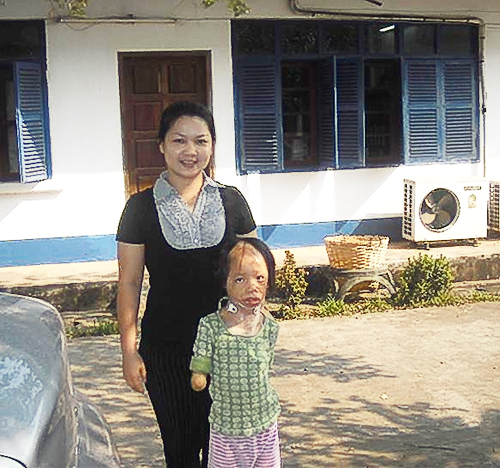 Because of her handicap, however, Boun Lod will not be allowed to go to a public school. Fortunately, our liaison in Vientiane has found a good private school that will accept her. 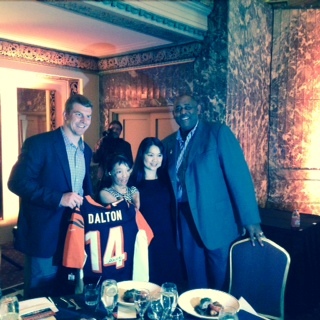 We will use some of the money remaining in the Boun Lod fund to help send her there.